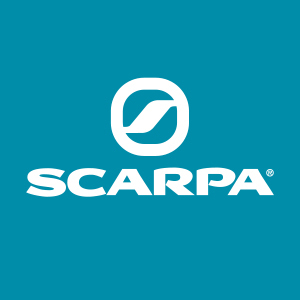 Scarpa’s extensive range of footwear can be used on so many different terrains; from expansive bogs to scree mountainsides to snow-covered slopes. 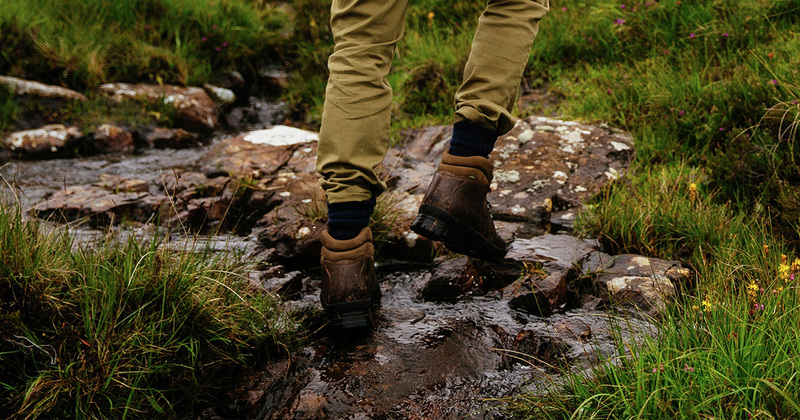 Consequently, when tackling these terrains your footwear can take the brunt of nature’s force. A boot upper is exposed to sucking mud, jagged rocks, wizened tree stumps, and the changeable British elements. 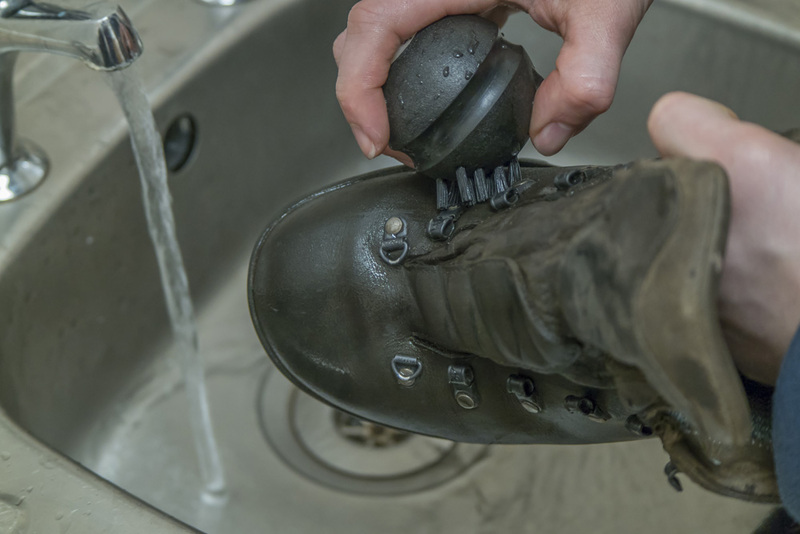 Over time and left unchecked this takes its toll, mud-laden and saturated boots are more prone to leakage and splitting as the acidic soil eats into the carefully crafted suede or untreated leather slowly dries out and cracks. 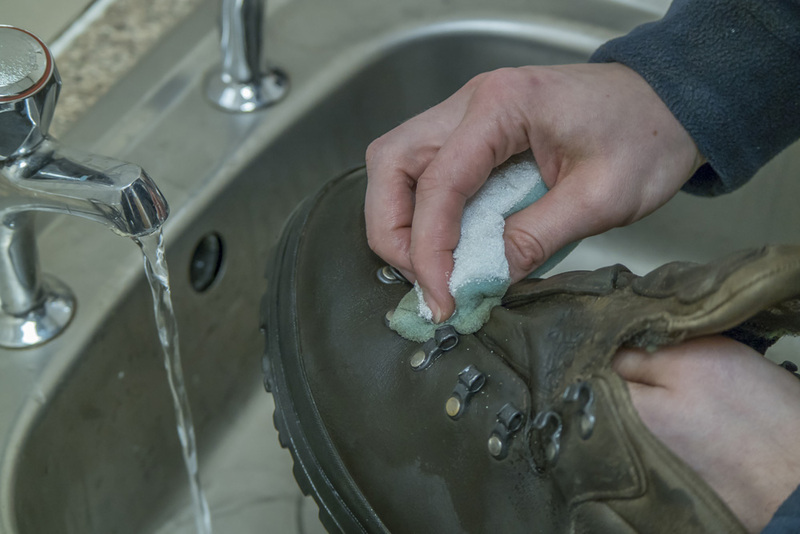 By following a few simple steps and guidelines the longevity of your footwear can be extended helping save any trauma on both your wallet and the environment. 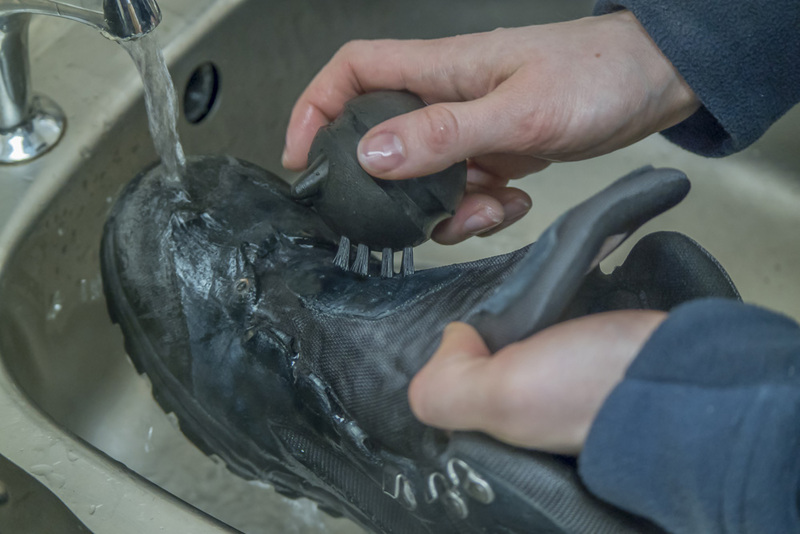 There are a million and one footwear care articles out there, however, this guide has been compiled by the Scarpa UK team and is specifically designed to service our footwear and most of our upper configurations. 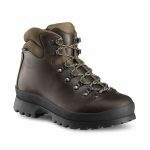 The two boots the featured in this guide are the Ranger which has a full leather upper and the Peak which has a suede upper. Prep your work area get your equipment together that you will require: clean warm water, a nylon brush, a sponge, water-based footwear cleaner, water-based reproofer and/or dry wax/ silicon cream. 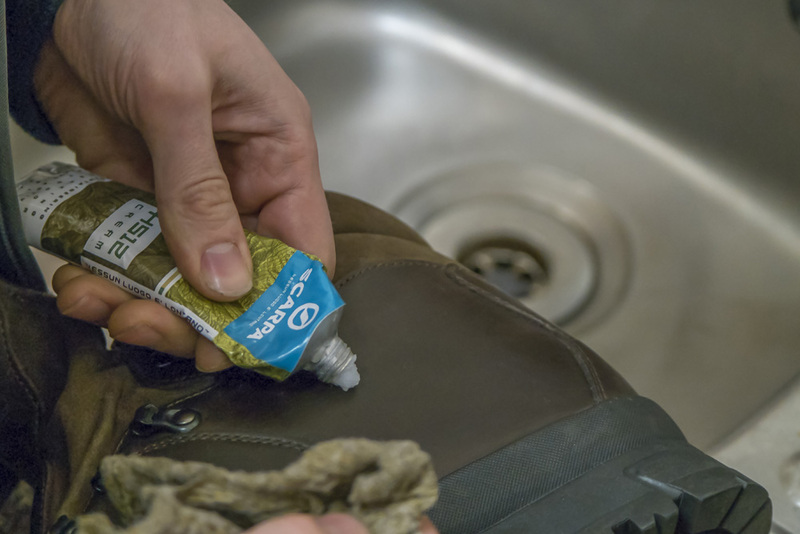 We recommend Nikwax Footwear Cleaning Gel, Nikwax Fabric and Leather Proofer or Scarpa’s Own water based proofer and HS12 Cream. Now that your work area is prepped and you’ve got everything together that you’ll need, grab your boots and you’re ready to go. 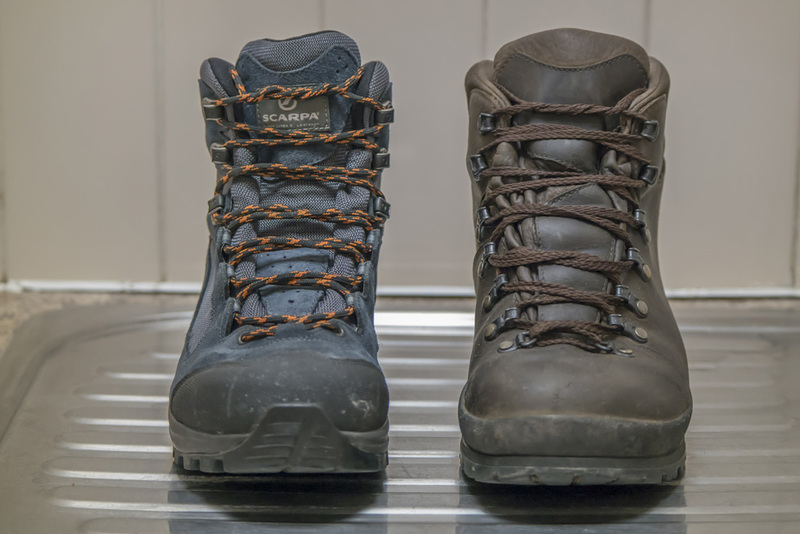 Before you start, remove the laces from the boot, this will allow you to get into all areas of the boot including those high flex points which are prone to wear. 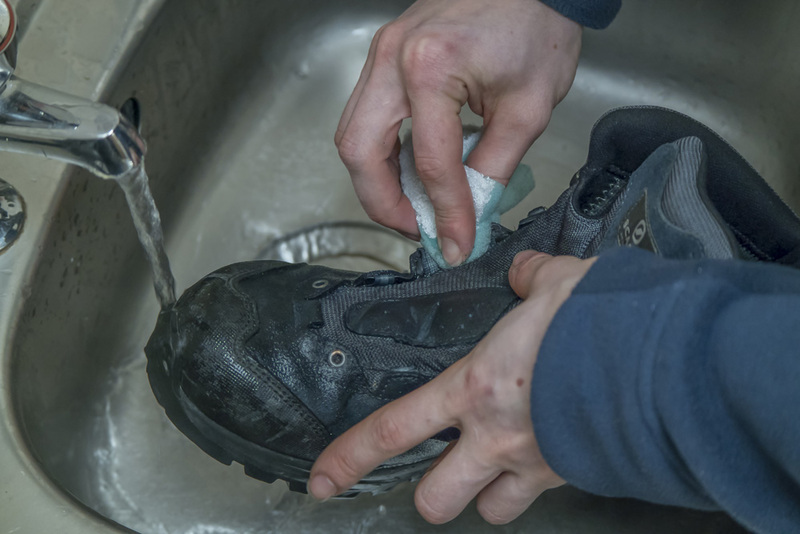 Use warm water when scrubbing and make sure to scrub deep into folds and covered areas. 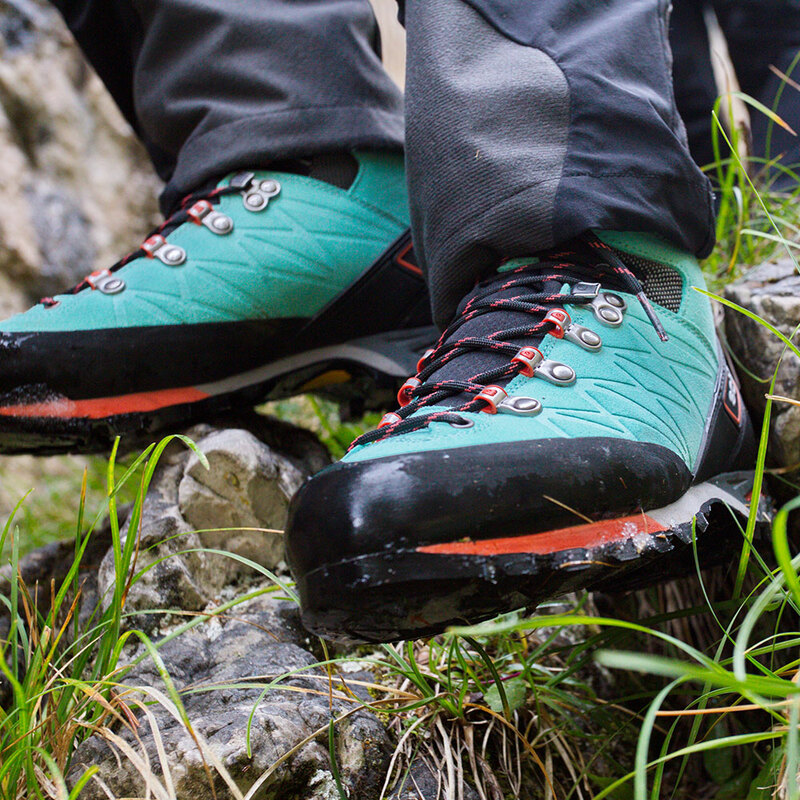 Tip: For more detail on individual Scarpa upper materials go to Scarpa Technical for a full breakdown. 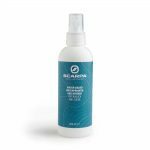 To aid in reaching some of those small and hidden areas, after brushing use a sponge or cloth to get into some of those hard to reach areas. Tip: Some of the key areas that are missed are: Eyelets, Stitching (particularly stitch lines under laces), folds in leather, and the flex point. Now you’ve removed the visible dirt, your attention can turn to the dirt that can’t be seen. Dirt and mud can seep into the upper and act as an abrasive from the inside out drying and cracking materials unseen. 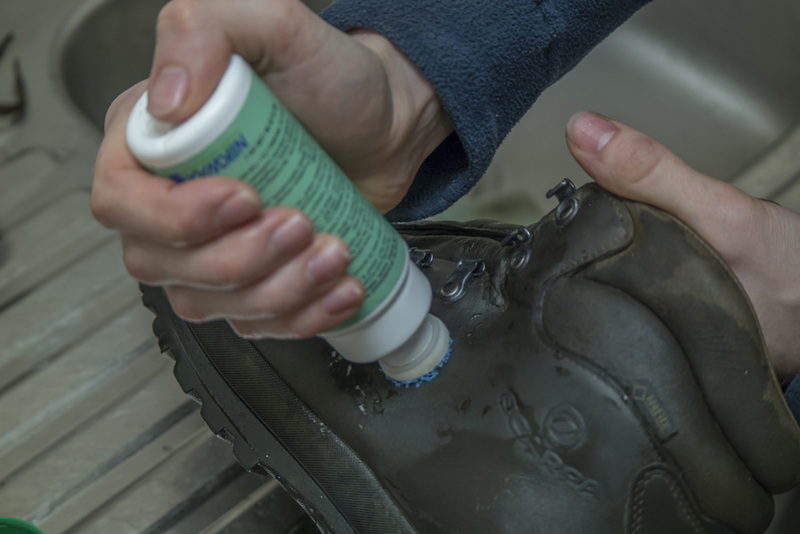 To remove this silent boot killer, apply a water-based cleaner such as Nixwax Footwear Cleaning Gel, all over the cleaned surfaces, use a dabbing motion to clean. 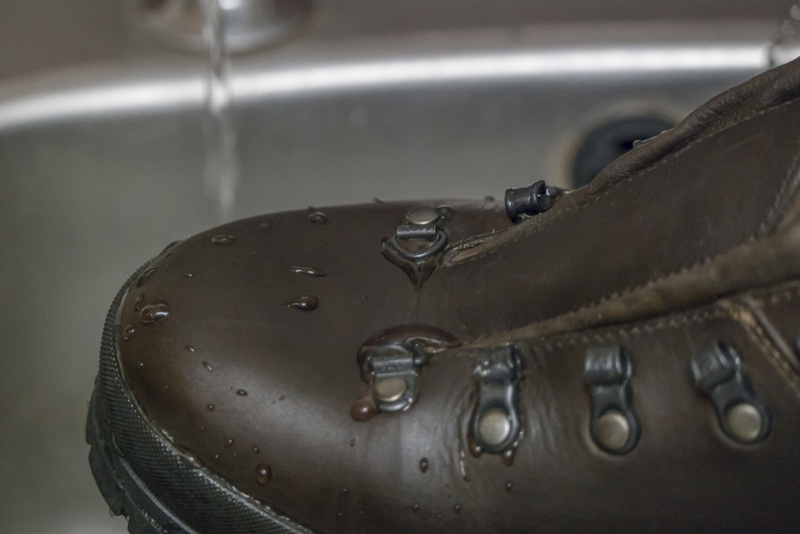 The cleaner will remove embedded dirt particles and prepare shoes for re-waterproofing. Tip: All the visible dirt should have been removed in the last 2 steps so if the cleaning gel brush is getting dirty go back a step and clean with a brush or cloth further. When cleaning gel is fully applied wash off with warm water. 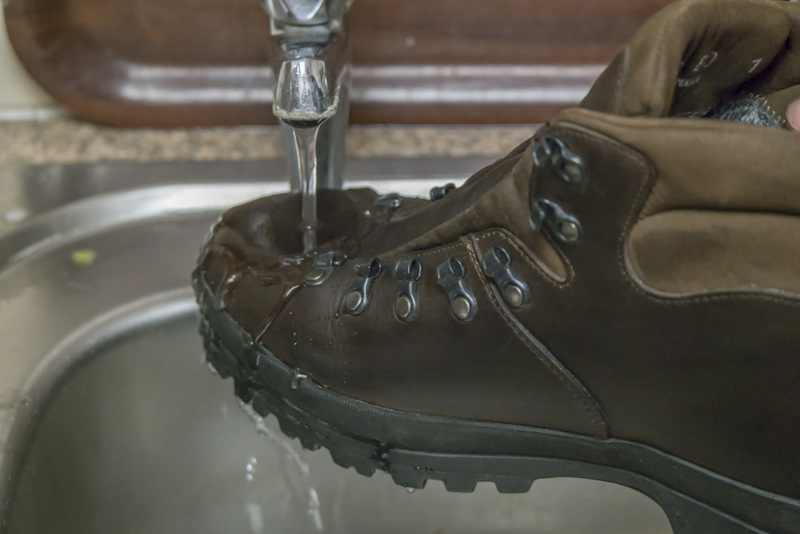 Tip: Be sure to clean the linings of your boots with a warm damp cloth after each use as well. Salt from perspiration can pass into the lining rapidly destroying the leather making it dry and cracked. 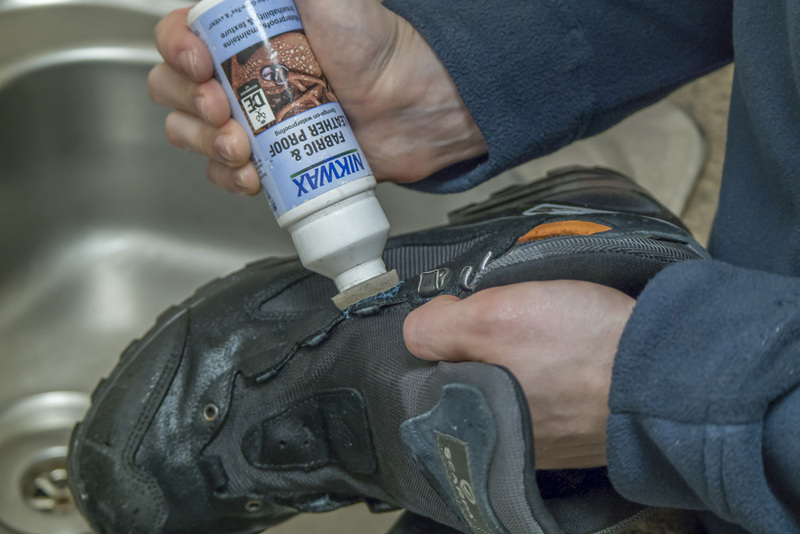 At this point, if using HS12 cream leave the Leather boots to dry naturally while if using a water-based proofer, reproof straight away. 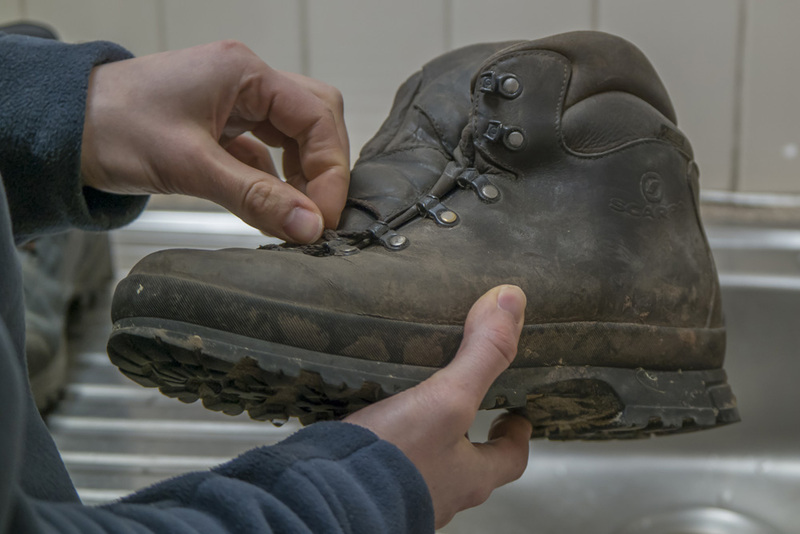 Tip: When drying naturally the boots need to be dry to the touch, make sure you dry boots in a well-ventilated airy location away from any strong heat sources. 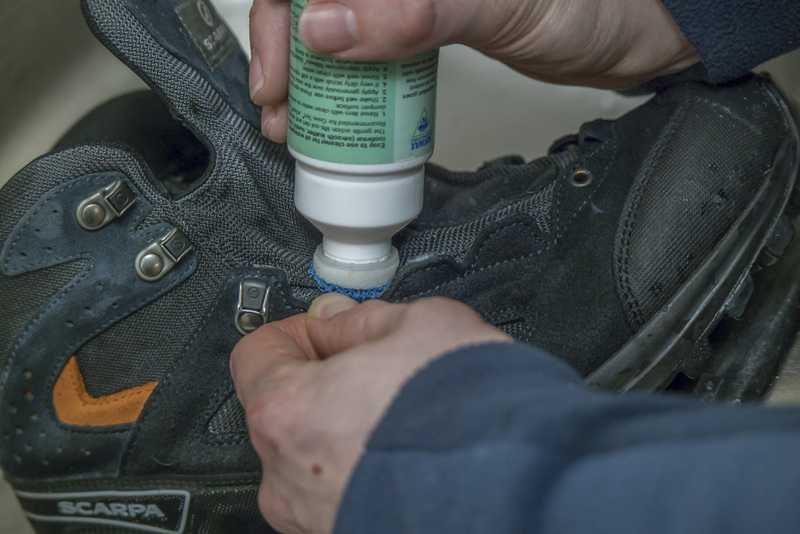 Apply Nikwax or Scarpa Re-Proofer to Fabric Boots when wet, dab in all the nooks and crannies you’ve just taken so long to clean! 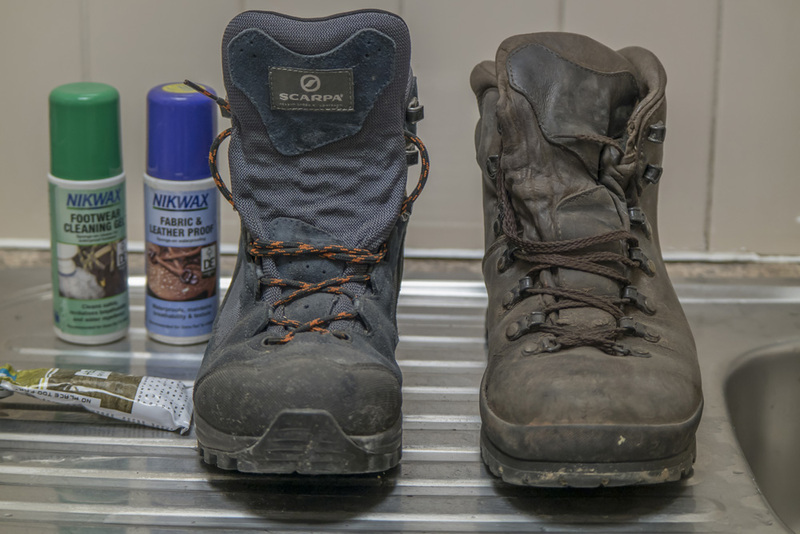 Now back to the Leather boots, after they have been left to dry naturally, apply HS12 cream; again ensuring that you get into all those easily overlooked areas. 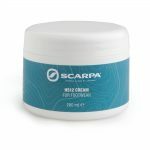 So there we have it, your leather or fabric Scarpa footwear is ready to face nature again, revitalised and strengthened. We advise that for maximum effectiveness the frequency of the cleaning process (points 1 – 6) should be after every trip, and while although reproofing must always be accompanied by the cleaning process above, it is only necessary when there are signs that water is soaking into the upper material and no longer beading on the surface. We hope you found this article informative and helpful, we would love to hear any questions so please get in touch with us on Facebook or Instagram. Here you can also share with us your adventures – and let us know where you’ve taken your Scarpas!